To accommodate rapid population growth and ensure equality among all its campuses, the Clark County School District adopted the use of prototypical designs for new school construction. TSK has designed and constructed over 40 prototype high schools for the district. 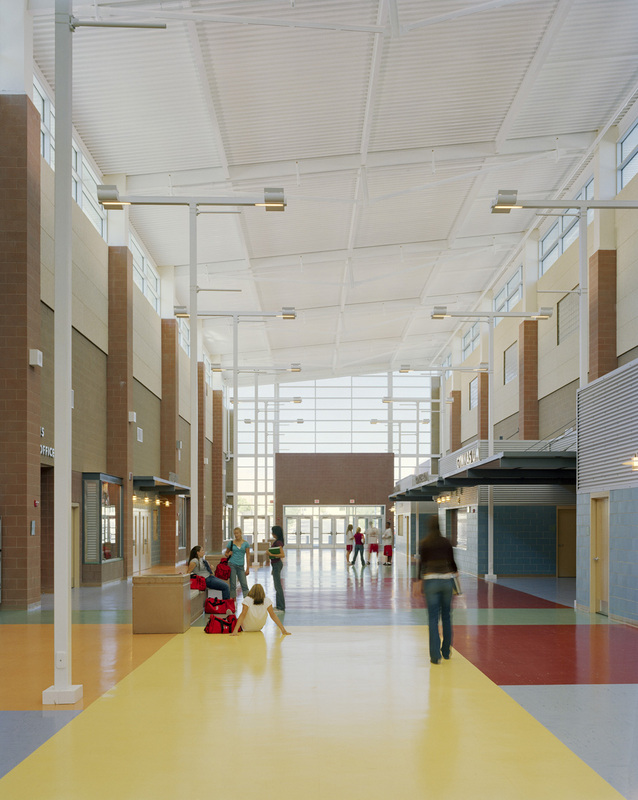 Since the completion of the first prototype high school, curriculum changes and new standards for day lighting and energy efficiency have required a number of design adaptations, all of which have been incorporated into Arbor View High School. The 2700-student school is organized around a two-story interior mall, which admits day light to the internal classrooms and also provides for secured student circulation. The design of the new prototype breaks down the perceived scale of the large comprehensive high school by creating four separate learning communities within the building. Each independent house serves as a “school within a school” with its own administration, student services, and mix of classroom types. Students in all four houses share occupational, science, art, and technology classrooms, as well as a gymnasium, a cafeteria, and a theater. A dramatic interior plaza located at the main entry serves as the hub of student activity for this closed campus. The large multipurpose space at the heart of the school is equipped with wireless web capabilities. This area acts as a thermal buffer between the classroom blocks and helps dampen temperature swings in the adjacent spaces. The mall is treated as a “semi-conditioned” space that is tempered with cool air that would normally be exhausted outdoors from the classrooms. Night flushing pre-cools the mall before students arrive in the morning, and thermal mass in the masonry walls and concrete slab helps combat temperature increases throughout the day.